I Have Run: It's all a moo point. Using my new SPIbelt. 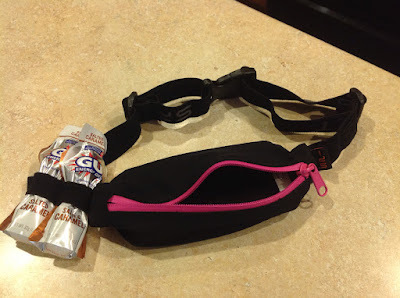 I have an older SPIbelt that I really liked using to hold my gels and phone on my long runs. I can't wait to try this one. It is part of the Performance Series and is new and improved, with slots for my gels and a bigger compartment to accommodate the ever-increasing size of my phone. Speaking of gels, I am actually looking forward to my next Salted Caramel GU. I know it will be considerably more than nine days until I'm running long enough to justify fuel while running, but I can still look forward to it! Getting out of the house to exercise. Since I was only cleared to cycle on a stationary bike, I am beginning to get tired of watching TV while trying to pass the time. Although it has helped that I've been watching Friends. That is one show that just never gets old. This is all a moo point. It's like a cow's opinion; it doesn't matter. It's moo. My thinking time. I don't think about much other than the hilarity that is Joey while spinning my wheels on the bike. Then I can't fall asleep at night because I'm too busy thinking about everything I would normally think about and plan and organize inside my head while running. So I guess that means I'm also looking forward to going to bed and falling right to sleep. Two birds. One stone. Family runs. I really miss our long run routines, whether it was my three people meeting me along the way while I ran or taking the girls to hang out with their dad at work while I logged my miles. Hey there! I should be able to start running again after my stress fracture as well, and was wondering what your plan was for how fast to up your mileage and stuff. Right now I am planning to do things like 8 minutes walking, 2 minutes running...followed by 6 minutes walking 4 minutes running the next week and so on. Any advice?! I go back to the doctor Friday and will let you know what he recommends for my return this time. We will celebrate your return to running. Maybe by me biking along side you as you run. It will almost be like running together again. Friends is always my exercise entertainment of choice. We still need to strength train together! 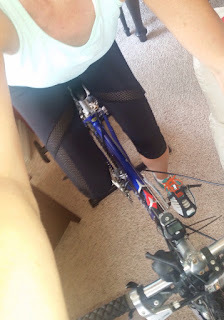 And the biking alongside me absolutely needs to happen.